Libby Pritchett Designs: January Template Freebie!! After all the gifts we made for the holidays, sometimes we need a little boost to get going on scrapping after the New Year. So the Libby Lou Crew wants to help you along...you can never have enough templates, right? Especially if they are free! 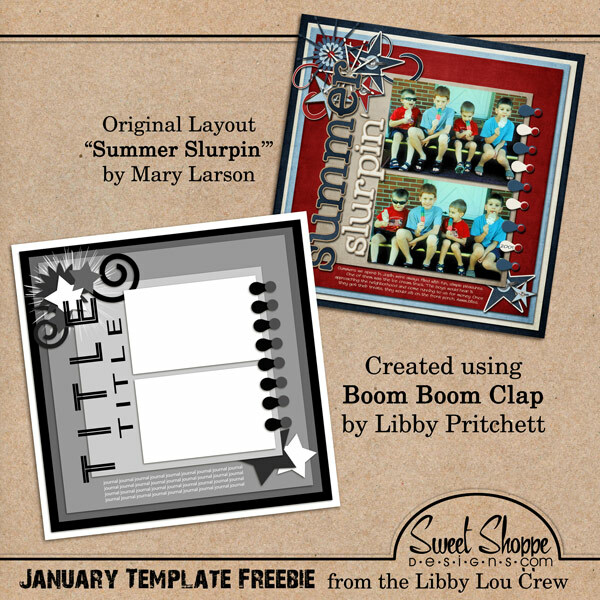 January Template Freebie and layout by Mary Larson using Boom Boom Clap. Thank you so much for this post. I want to let you know that I posted a link to your blog in CBH Digital Scrapbooking Freebies, under the Page 1 post on Jan. 10, 2011. Thanks again. Thanks so much, Libby! You're right - there's no such thing as too many templates!